Martha Orcutt was just 9 years old when she first learned how to sew. Her first project consisted of a skirt and matching scarf using a straight stitch. 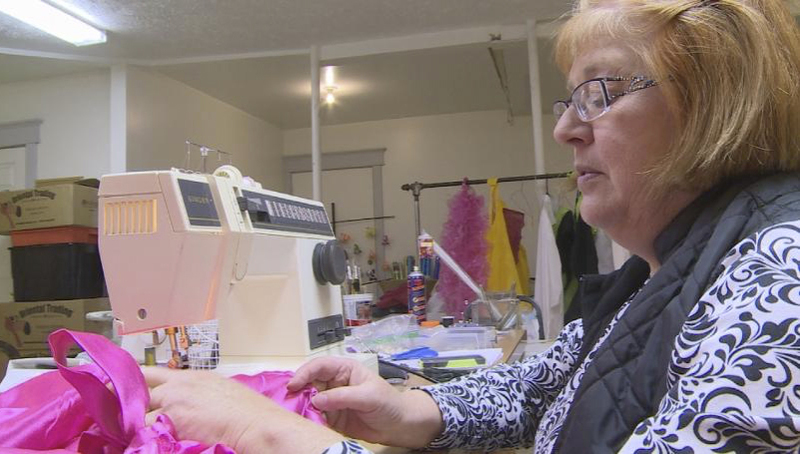 Today, Martha sews elaborate costumes for the North Platte Community Playhouse Theatre. It all began in Fairview, Illinois, where Martha was a member of the Fairview Homemakers 4-H Club. Although small, the town had a very large and active 4-H community. There were about 50 girls in the 4-H club, Martha said. Martha’s love of sewing began with that first small skirt and scarf. Her mother eventually scraped together enough money to buy a portable Singer sewing machine, and she’s been sewing ever since. As a young girl, Martha thought learning to sew was a skill that would make her a better wife and mother. She was glad she would be able to stitch up tears and hem clothing, or make blankets for her family. Even over the next forty years, sewing remained a hobby for Martha. She attended college and got married. She sewed for her family, making baseball caps for her son and dresses for her daughter. Many of her friends either didn’t know how to sew or didn’t enjoy it, so Martha would help them out here and there. It wasn’t until she got a job working in a Sherwin-Williams paint store in North Platte, Nebraska, that Martha began turning her sewing skills into a paycheck. She was working as a decorator and selling window treatments at the time. Customers would often request a valance or curtains to go with their new windows, so Martha would offer to sew those. “It got to the point where I realized I could set my own hours and I could work at my own pace, so I quit my job at Sherwin Williams and I let people know that I would do window treatments for them. I just became the decorator,” she said. Through word of mouth, Martha’s sewing business expanded and she became the “go-to” person in town for the community’s sewing needs. Meanwhile, Martha enjoyed acting and singing at the Community Playhouse Theatre. As Martha grew older, however, she realized it was time to move off the stage and behind-the-scenes. One of the directors asked her if she’d be interested in sewing costumes for a play and the rest is history. “I got to step off of the stage and step into something else that I enjoy doing and still be around to help mentor young people who are interested in being on the stage like I was,” Martha said. Today, Martha designs and sews various costumes every year for the Theatre, while also sewing for the community out of her home. This passion all began because of 4-H, and Martha credits her sewing career to the Fairview Homemakers 4-H Club. Her favorite part about sewing, she said, is the art behind it. Although learning to sew was probably the most impactful part of Martha’s 4-H experience, she also enjoyed learning how to cook, plan meals, decorate and budget her money. Martha is still keeping herself busy sewing for the Theatre and for the North Platte community. Although she isn’t sure she will continue sewing as much as she does now, she won’t be stopping anytime soon. No Comments to "North Platte Seamstress Has Roots in 4-H"